Howard McGhee was born in Tulsa, Oklahoma and raised in Detroit, Michigan. During his career, he played in bands led by Lionel Hampton, Andy Kirk, Count Basie and Charlie Barnet. 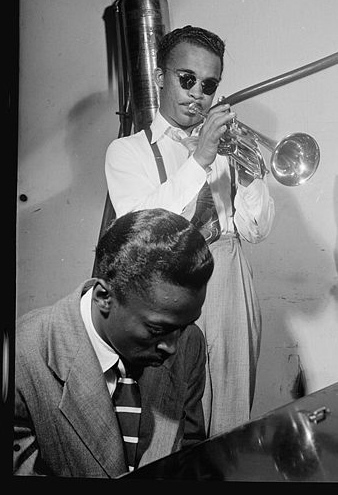 He was in a club listening to the radio when he first heard Parker and was one of the early adopters of the new style, a fact that was disapproved by older musicians like Kid Ory. In 1946-47, the new label Dial organized some recording sessions in Hollywood with Charlie Parker and the Howard McGhee combo. The first was held on July 29, 1946. The musicians were Charlie Parker (as), Howard McGhee (tp), Jimmy Bunn (p), Bob Kesterson (b), Roy Porter (d). The titles played were "Max is Making Wax", "Lover Man", "The Gypsy" and "Be-bop". However, Charlie Parker was sick and fainted at the end of "Be-bop". Some hours after this session, Parker was admitted to Camarillo, a psychiatric clinic at the north of LA, where he spent six months. After this, Charlie Parker returned to music making and a new recording session was organized on February 26, 1947, also for the Dial label. Howard McGhee continued to work as a sideman for Charlie Parker. He played on titles like "Relaxin at Camarillo", "Cheers", "Carvin the Bird" and "Stupendous". The last three of these tracks were composed by Howard McGhee. McGhee played live with Parker in a club at LA in March of the same year. Drug problems sidelined McGhee for much of the 1950s, but he resurfaced in the 1960s, appearing in many George Wein productions. His career sputtered again in the mid-'60s and he did not record again until 1976. He led one of three big jazz bands trying to succeed in New York in the late 60's, perhaps one more than New York could accommodate at the time. While the band did not survive, a recording was released in the mid '70's. He taught music through the 1970s, both in classrooms and at his apartment in midtown Manhattan, and instructed musicians like Charlie Rouse in music theory. He was as much an accomplished composer/arranger as he was a performer.